i’ll be the first to admit that halloween is not my favorite holiday. i have absolutely no decorations (except these adorable pine cone spiders that we made last year), no pumpkin carving skills to speak of, and i can’t stomach most of the garish costumes and decorations that come with halloween. > heat ‘n bond – this is what makes the bunting extra sturdy. no flopping triangles here no matter the angle! now for the easy step-by-step! 1. the very first thing you need to do is decide how you want your triangles to look. we made ours about 1.5x tall as they were wide. we were able to get 4 cut triangles out of each fat quarter. once you’re happy with your triangle, make a pattern using a piece of paper and then use it to cut all your triangles. 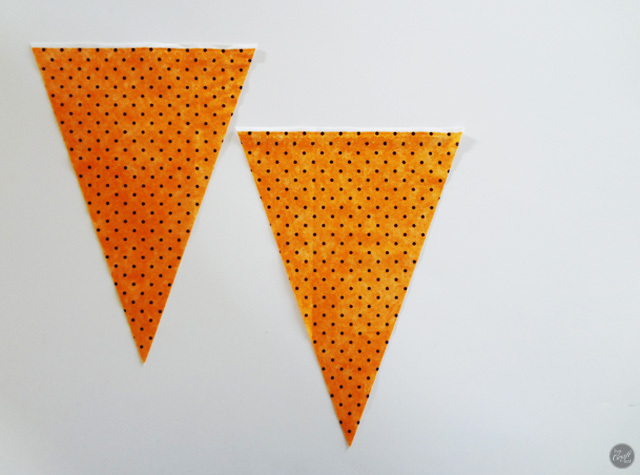 use this smaller triangle template to cut out your heat n bond – 1 triangle per set of cut triangles. 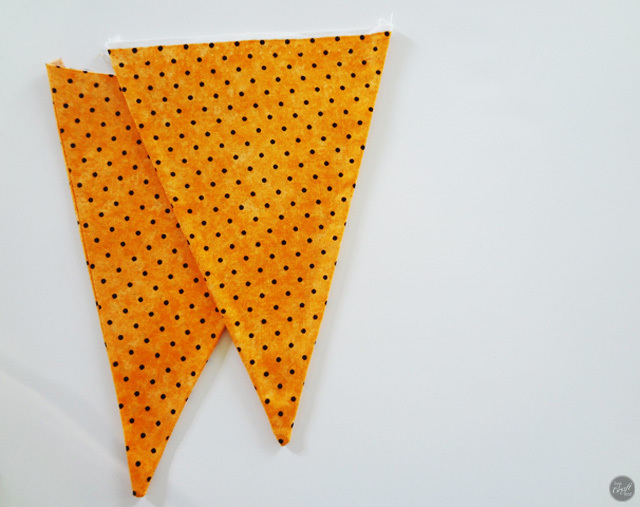 take 2 fabric triangles and place them right sides together. 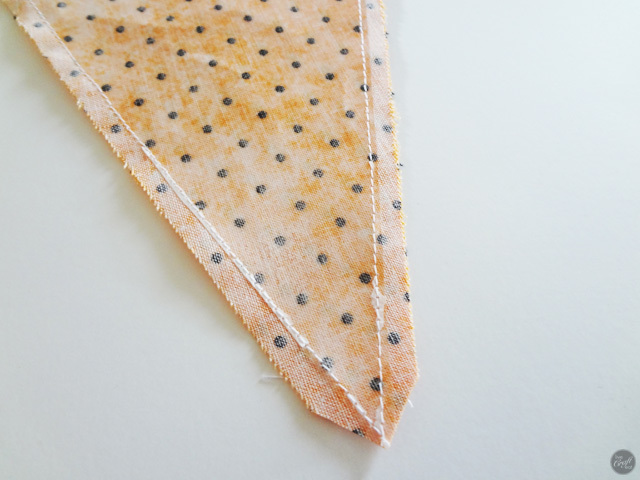 place the heat n bond on top of the triangles with the rough side facing toward the fabric. iron. 3. next, with the triangles still right sides facing and with the heat n bond now attached to the back of the top triangle, sew the triangles together on the left and right sides, down to the point. do not sew the top of the triangle closed. 4. once they’ve been sewn, remove the paper backing of the heat n bond. it’s okay if little bits get stuck under some of the stitches – nobody will see them. cut the bottom corner (as shown above) to prevent the corner from being to bulky when you turn them right side out. 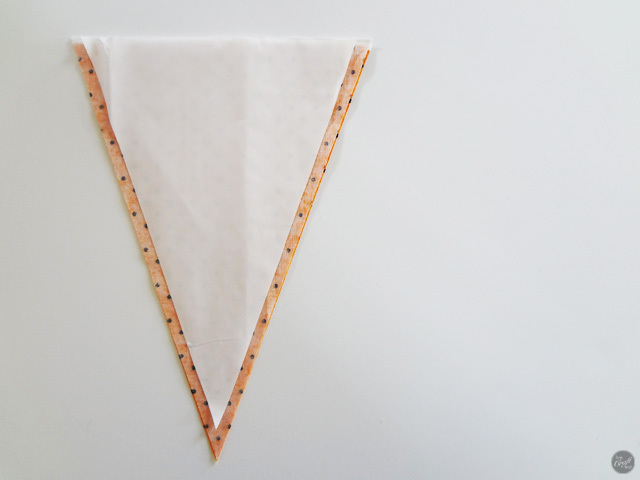 5. turn the triangles right side out using a bone folder or other tool (like a knitting needle, etc) to straighten the edges and to make a nice point at the bottom of the triangle. iron flat, activating the other side of the heat n bond and making the triangles as sturdy as can be. 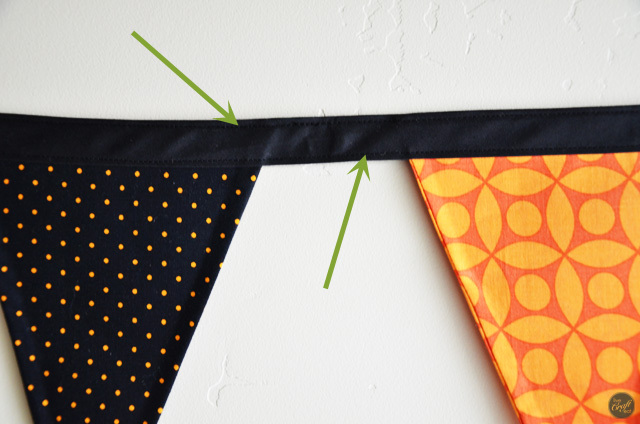 6. to put it all together, grab your seam binding (that’s already pre-folded), place the top of the triangles inside the fold, making sure to spread them evenly across your chosen length, and pin them in place. 7. sew across the bottom of the seam binding, and then again across the top. 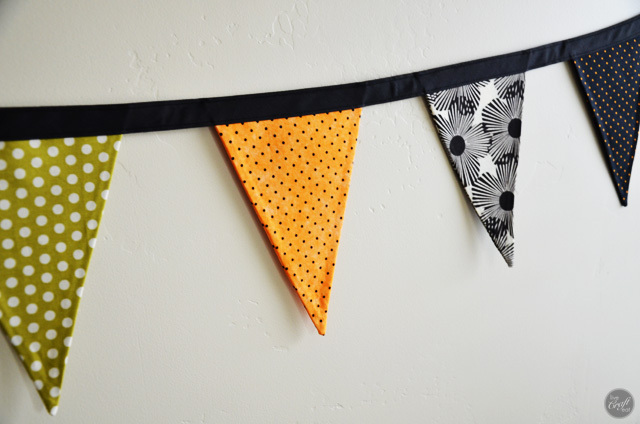 and there you have a super easy, crisp-looking fabric bunting to hang anywhere in your house! 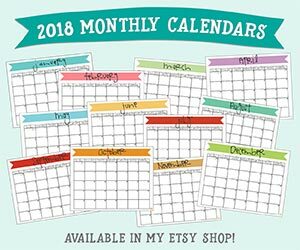 we hang ours on our staircase, but a mantel, entertainment center, or just on the wall look amazing, too!it’s an easy way to add color and decorate your house for any holiday or occasion! 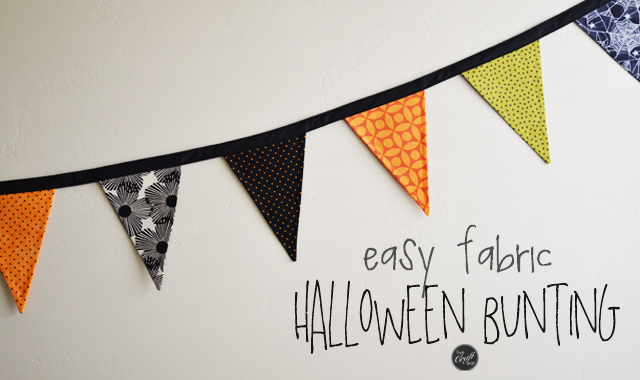 you could also use the same fabrics you used in a child’s blanket or quilt and make coordinating bunting to decorate their room – the possibilities are truly endless! How cute and how clever! 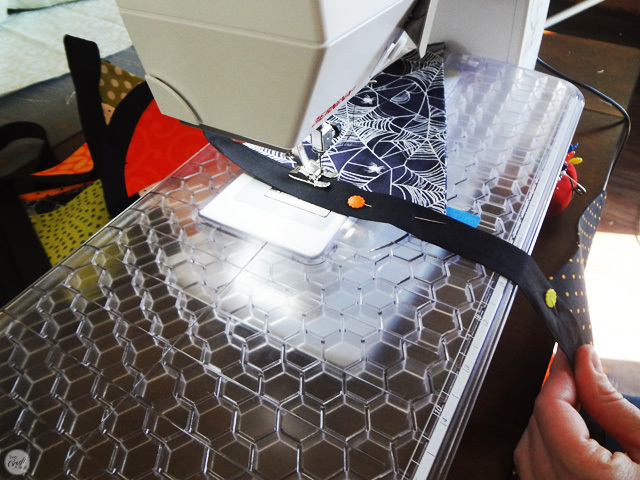 What is that plastic surface on your sewing machine called? Did it come with your machine or can it be purchased separately? Thanks! Hi Diane! My sister actually brought her sewing machine with her for the day 🙂 It’s a Bernina 440 – Quilter’s Edition (QE) and it did come with the machine. 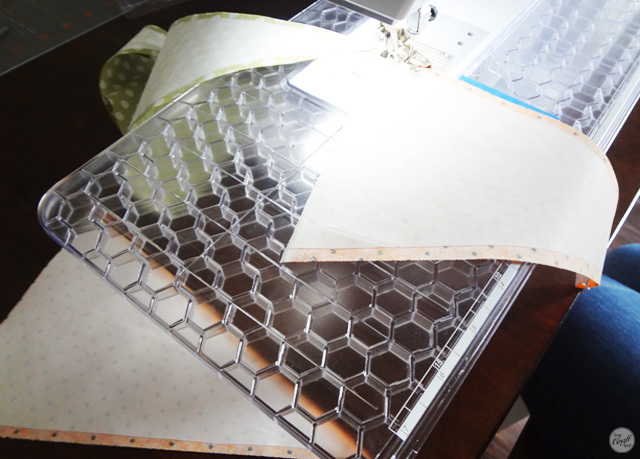 The plastic surface is called a “slide-on free-arm table”, and if you have a Bernina machine you can find where to buy the part online. Great question – thanks for asking!